(Nanowerk News) Gimball bumps into and ricochets off of obstacles, rather than avoiding them. 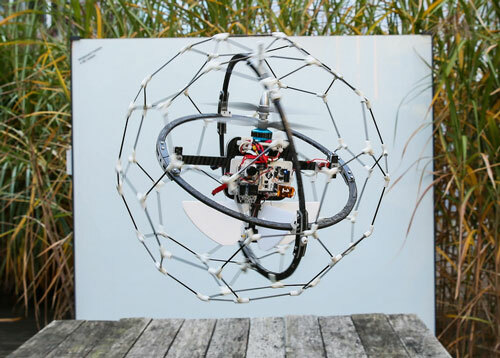 This 34 centimeter in diameter spherical flying robot buzzes around the most unpredictable, chaotic environments, without the need for fragile detection sensors. This resiliency to injury, inspired by insects, is what sets it apart from other flying robots. Gimball is protected by a spherical, elastic cage which enables it to absorb and rebound from shocks. It keeps its balance using a gyroscopic stabilization system. When tested in the forests above Lausanne, Switzerland, it performed brilliantly, careening from tree trunk to tree trunk but staying on course. It will be presented in public at the IREX conference in Tokyo, Japan from November 5-9, 2013. Powered by twin propellers and steered by fins, Gimball can stay on course despite its numerous collisions. This feat was a formidable challenge for EPFL PhD student Adrien Briod. "The idea was for the robot's body to stay balanced after a collision, so that it can keep to its trajectory," he explains. "Its predecessors, which weren't stabilized, tended to take off in random directions after impact." With colleague Przemyslaw Mariusz Kornatowski, Briod developed the gyroscopic stabilization system consisting of a double carbon-fiber ring that keeps the robot oriented vertically, while the cage absorbs shocks as it rotates. Most robots navigate using a complex network of sensors, which allow them to avoid obstacles by reconstructing the environment around them. It's an inconvenient method, says Briod. "The sensors are heavy and fragile. And they can't operate in certain conditions, for example if the environment is full of smoke." Gimball's robustness lies in its technological simplicity, says Briod. "Flying insects handle collisions quite well. For them, shocks aren't really accidents, because they're designed to bounce back from them. This is the direction we decided to take in our research." Presentation and demonstration of the GimBall in various environments. The flying robot is prepared to deal with the most difficult terrain out there. "Our objective was exactly that – to be able to operate where other robots can't go, such as a building that has collapsed in an earthquake. The on-board camera can provide valuable information to emergency personnel." The scientist had an opportunity to test his prototype in a Swiss pine forest. Fitted out with just a compass and an altitude sensor, Gimball demonstrated its ability to maintain its course over several hundred meters despite colliding with several tree trunks along the way. Gimball is the latest in a long line of colliding robots developed in the laboratory of EPFL professor Dario Floreano. But its stabilization system, spherical shape and ultralight weight – barely 370 grams – demonstrate the potential of the concept better than ever before. "The mechanics must also be intelligent, since complex obstacle avoidance systems are not sufficient," says Briod. Even so, he insists, "we're not yet ready to compete with our model. Insects are still superior."